I am planning on transporting a TAFG tomorrow and I need to buy or rent a local dolly. It is important that I do not damage this pin. Some have recommended a horizontal dolly as some of my door frames are 28.5-29” wide. I can take off some doors or rotate the head of the pin a bit. I would like to avoid detaching the head unless there are clear diagrams to know how to rewire it. Any recommendations on a local place to buy or rent a dolly? Home Depot or similar. Links or specific models are ideal so I know I get the correct one. Find a harbor freight and get one of the blue hand trucks with the big wheels. Make sure to search for a 15% off coupon. Also pick up 3 packing blankets. Find a roll of 80 gauge stretch wrap--18"x1500", if possible. Home Depot should carry it, but you can get it cheaper per roll from uline.com if you can wait. Wrap the game and back box in about 3 layers to help protect it from scratches. At home depot, get a small packing box (put the foot of the game on this), and use it to protect the bottom of the cab when moving with the hand truck. The cardboard is also helpful for sliding the game around on floors. Get 3 large packing boxes, and fold them in half. Use one in the hand truck. When packing the game in your vehicle, use them to protected the sides of the cabinet after covering the cab and backbox in the packing blankets. Also, get 3-4 medium boxes, put them on the floor of your vehicle, and layer them so they slide over each other when you push the cabinet in. Much easier than brute forcing it, and also helps protect both the game and your vehicle's interior. Don't be afraid of detaching the backbox if you need to. Just take lots of clear photos of each connector, and double check them when plugging them back in later. 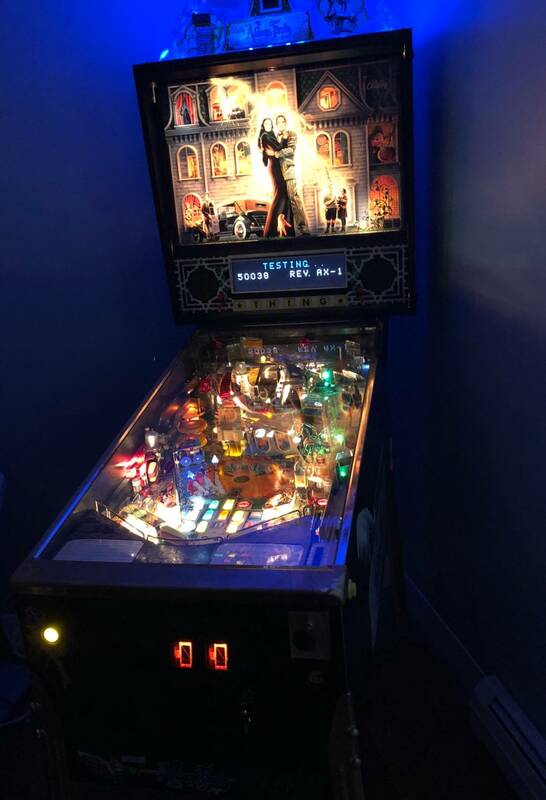 Obviously, it's easiest to be able to just fold the game up and go, but if you don't have space, it's easier to remove the backbox entirely instead of trying to maneuver the cabinet and the backbox. There would also be a lower risk of damaging the cabinet/backbox when trying to juggle/maneuver both at the same time. Also don't forget to take out the balls! Thanks to everyone for your help. I ended up taking off doors, door frames and ended up having to unbolt the head and turn it slightly to make it through since my house was built in the 1800s. We managed to transport it without damaging anything and it powers on fine. TAFG is the holy grail of collector pins for me. What number is yours? I for one would leave it as close to original as possible, great find. It’s number 996 which I believe would be the 5th to last made. Certificate has all but two signatures which seems to be common. All serial numbers match and everything I’ve been told to look for on these is perfect. I will not be buying any pins unless it’s a killer deal for a long long time.